It’s self-care February and a huge part of loving ourselves is taking care of our bodies. Brace yourselves my friends today we are talking about body stinkiness!!! Self–care of our bodies involves yummy things like amazing body lotions and creams and balms. Facials and massages- all the things that make us feel pampered and well taken care of. But there is the other side of taking care of our bodies. That involve detox and often these are less “glamorous” than the facials and massages. Detoxing like using a detox paste and dry body brushing. Then…oh then there is detoxing so we don’t, well to be honest…get too stinky. I read about detoxing my armpits and it intrigued me. The armpits are really close to our breasts and lymph glands and if we have used traditional aluminium antiperspirant deodorants for years it’s worth connecting the dots. Detoxing any part of our body is always a good idea and even though I stopped using aluminium antiperspirant’s years ago I thought I would give this a go. 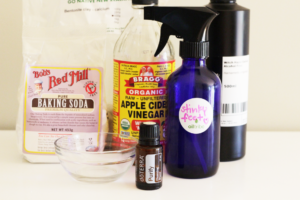 It’s really simple- equal parts of Apple Cider Vinegar and Bentonite clay- 1 tablespoon of each is more than enough. Mix together to form a paste with 5 drops of Purify. If it’s too thick for your liking add a bit of water- I like a thick paste. Smear on and leave for 5 min initially then wash off. I did my detox for a 5 days and worked up to 20 minutes on Day 5. The result: Definitely less stinky! I wasn’t super stinky to start off with but when using natural deodorant you always run the risk of underarm stinkiness. A detox will help this. Now onto another form of stinkiness…. This one involves my son. Anyone else have boys? Lately I cannot believe the smell emanating from my sweet child’s shoes and feet. It’s been a rude shock. I could get the stuff from the pharmacy that I know will stop the stink. But I also know that the soles of the feet are the biggest in the body and who know what he will be absorbing into his body from that toxic power? I have made a spray for his shoes: Use a tablespoon of Baking soda, 20 drops of Purify and a cup of (alcohol free) Witch-hazel. Pop into a spray bottle and give a good shake before using. I use the spray before he puts his shoes on and after he takes them off. Plus I have started washing his feet when he gets home- a really good scrub! Then I get him to sit down with his feet up and apply Purify and Lemongrass diluted in a bit of Fractionated Coconut oil to the bottom of his feet. It’s early days but * touch wood *, the stinkiness is a LOT less! The hero of de-stinking is of course the Purify Blend- also called the Cleansing Blend. It’s a mix of Lemon, Lime, Siberian Fir, Austrian Fir, Pine, Citronella, Melaleuka and Cilantro. Purify is amazing in natural deodorant or used to make your washing smell amazing! I used Lemongrass as well as Purify under my son’s feet for an extra detox kick. So there you go my friends, not the most glamorous of all posts but as functioning human beings, we all get stinky at times!